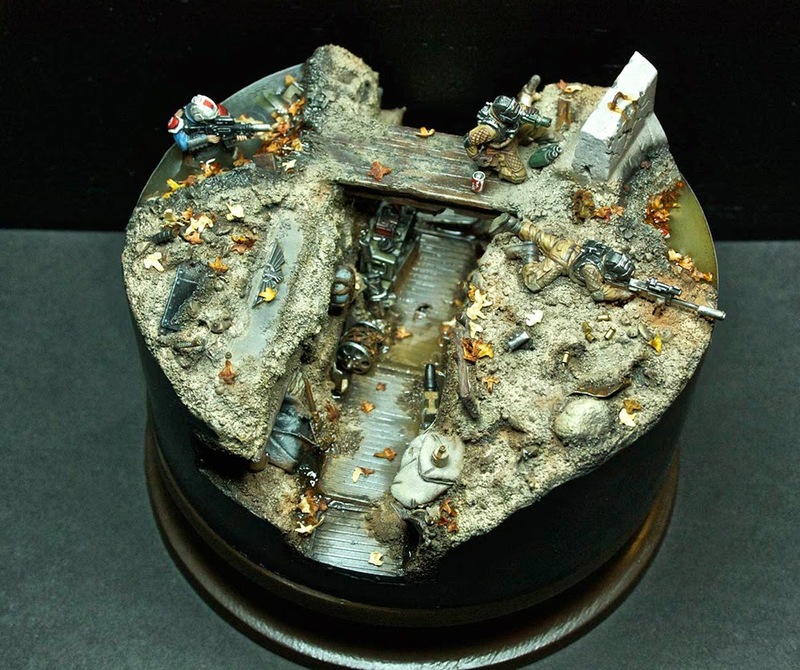 You have to love a well done diorama. Let's get the painting out of the way first, it's top notch. Everything is painted to an extremely high standard with very muted and realistic colors. While the painting is great, what really make this mini stand out is the composition and conversion work done. 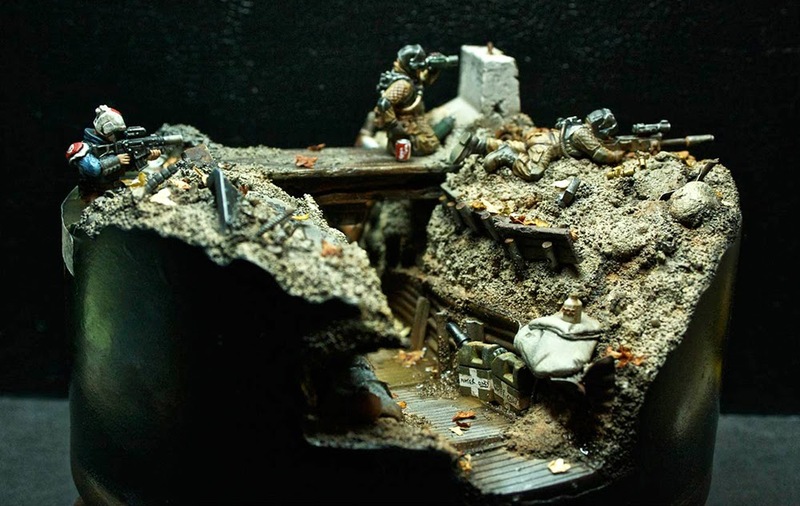 There is so much character in every part of this diorama. The attention to detail is astounding. For instance, look at all of the little bits and bobs in the trench system. This would have been easy to ignore and leave at a bare minimum but instead he has made it look like something that's really lived in. Some of my favorite details are the water, leaves and soda cans. There is one near the spotter and there is also one crushed up in one of the puddles. Again, this just adds so much life to it. The only thing that throws me off a bit is the inclusion of some modern day mentality into a 40k piece. Besides just using 40k models this is clearly supposed to be set in the dark millennium due to the Imperial Eagle on the trench. Some things, like the soda cans, seem a little out of place in such a grim dark setting. I know they probably have a soda like equivalent in the far future, but it's just something we have never seen or read about. You may be thinking, didn't I just say I really like the cans and now I'm saying how they look out of place? I am a little torn on them. They really do add a ton of life and detail to the scene, I just think its the Coca-Cole-esque paint job on them that's throwing me off. Regardless, this diorama is really great, and at this point I'm just nit-picking.